Plasmocure™ is recommended for the eradication of mycoplasmas that appear, in very rare cases, to be resistant to Plasmocin™. 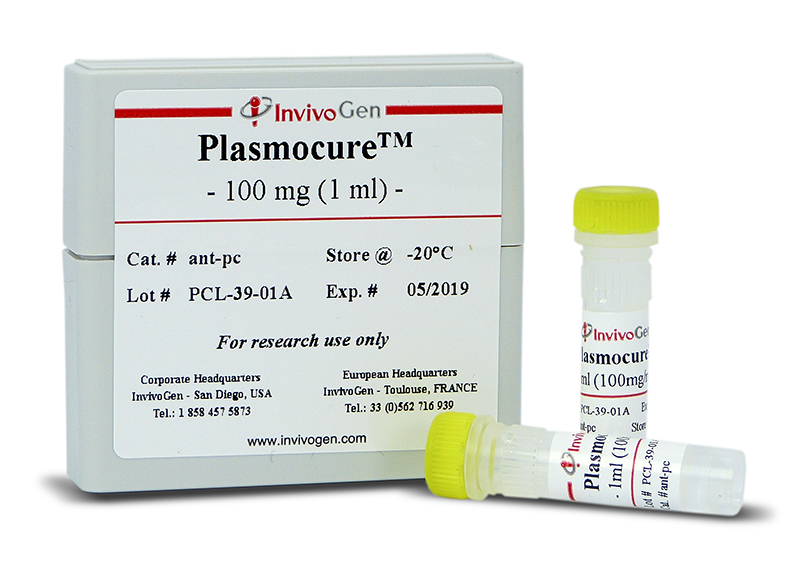 Plasmocure™ is active against various mycoplasma species that infect mammalian cell cultures including M. hyorhinis, M. orale, M. arginini, M. fermentans, M. hominis and Acholeplasma laidlawii. Plasmocure™ combines two antibiotics that act through different mechanisms than those found in Plasmocin™. The first antibiotic binds to the 50S subunit of the ribosome and blocks peptidyltransferase activity. The second anticbiotic binds to isoleucyl-tRNA synthetase and halts the incorporation of isoleucine into bacterial proteins. A two-week treatment with Plasmocure™ is usually sufficient to completely eliminate the mycoplasmas. A moderate toxicity can be observed during the course of the treatment but full recovery of the cell line is expected once mycoplasmas are eliminated. Plasmocure™ is provided as a cell culture tested, sterile filtered solution at a concentration of 100 mg/ml. Upon receipt it can be stored at 4°C for 12 months or at -20°C for long-term storage. Confounding off-target effects of BH3 mimetics at commonly used concentrations: MIM1, UMI-77, and A-1210477. Venetoclax Is Effective in Small-Cell Lung Cancers with High BCL-2 Expression. Effectiveness of Plasmocure™ to eliminate mycoplasma species from contaminated cell cultures: A comparative study versus other antibiotics. 2017 Am J Pathol. 187(10):2259-2272. Apolipoprotein E promotes invasion in oral squamous cell carcinoma. Drug Repositioning for Cancer Therapy Based on Large-Scale Drug-Induced Transcriptional Signatures. Lee H, Kang S, Kim W.
2016 Cell Death Dis. 7(8):e2322. TLR and NLRP3 inflammasome-dependent innate immune responses to tumor-derived autophagosomes (DRibbles). 2015 Arch Pathol Lab Med. 139(11):1349-61. MicroRNA-375 suppresses extracellular matrix degradation and invadopodial activity in head and neck squamous cell carcinoma. An NLRP7-containing inflammasome mediates recognition of microbial lipopeptides in human macrophages.